Chasing yield is often a losing proposition for dividend investors, as these three high-yield stocks help show. Click here to see the latest list of stocks you should steer clear of. Dividend investing, when done correctly, is one of the simplest and most powerful wealth-building investing strategies available to individual investors. However, it is important to remember that, as with any investing strategy, errantly applying the strategy can lead to disastrous results. In this article, we'll highlight three dangerous dividend stocks: Their temptingly high dividends are siren songs that are best avoided. Shares of Frontier Communications (NASDAQ:FTR) took a beating in 2016, and the risk-laden outlook for the company should be enough to make investors pass on its 11% dividend yield. By far the most important storyline affecting the company was its 2016 deal to acquire Verizon Communications' wireline voice, broadband, and video assets in California, Texas, and Florida for $10.5 billion. This move effectively doubled Frontier's customer count, which was supposed to strengthen the company's competitive stance against larger and richer rivals. Alarmingly, Frontier promptly lost newly acquired customers in each of the two earnings reports after the acquisition closed, leaving lingering concerns that customer attrition will continue. In terms of its dividend, the company's financial footing isn't necessarily bulletproof either. Frontier currently holds more short-term liabilities than short-term assets, and as of its most recent quarter its debt-to-equity ratio is an aggressive 3.6. More worrisome still, all of the three main credit-rating agencies currently maintain negative outlooks on Frontier's financial status. The company has been free-cash-flow negative in each of its past three quarters, and its substantial debt burden could become a flash point if subscriber losses continue. In a world replete with income-investing options, banking your financial future on Frontier's continued performance seems like an unnecessary risk. Its shares dropped like a rock earlier this month when the company unexpectedly reduced its 2017 outlook to reflect continued weakness in its North American business. 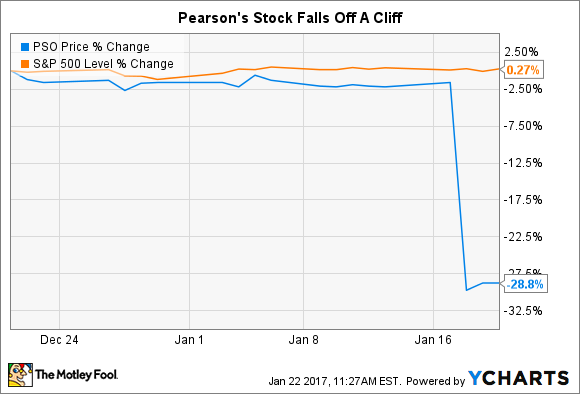 Worse still for income investors, the London-based Pearson stated it plans to "rebase" its 2017 dividend downward from the 52 pence ($0.42) per share it paid in fiscal 2016. Investors eyeing its seemingly lucrative cash distributions will now receive less from the publishing giant, though it remains unclear what its new per-share dividend payments will ultimately be. Pearson announced yet another restructuring plan -- its third since 2012 -- as part of its guidance adjustment, ostensibly to calm skittish investors. The company plans to sell its stake in Penguin Random House, the proceeds of which will be used to shore up its balance sheet, invest in new products, and return capital to shareholders. The publishing giant has now missed its half-year estimates in six of the last eight quarters, and its continued struggles give income investors little reason to believe its travails have come to an end. Landline telecom giant CenturyLink's (NYSE:CTL) 8% dividend is perhaps the most stable of the three companies discussed here, although that isn't much of a compliment considering the others. Much like Frontier Communications', CenturyLink's business model is simply on the losing end of history. CenturyLink provides landline phone access and internet services to consumers and businesses in 37 states, a set of services likely to remain in decline over the long term. As just one data point underscoring this secular headwind, CenturyLink's number of total access lines had declined from 13 million in 2013 to 11.7 million in 2015. It also bears noting that CenturyLink pays an aggressive amount of its profits and cash flows as dividends. Case in point, its dividend payout ratio currently sits at 127% of net income. On a cash flow basis, dividend payments accounted for roughly half of all cash flow from operations, after accounting for required capital spending over the company's most recent nine months. This isn't so onerous as to trigger a reduction in dividend payments in the near term, although CenturyLink had to reduce its dividend payments because of business headwinds as recently as 2013. If there is one saving grace for CenturyLink, it almost certainly comes in the form of the company's pending acquisition of Level 3 Communications. The deal should provide CenturyLink with a more global footprint, significant tax-loss assets, and cost-saving synergies. Assuming the deal doesn't encounter any regulatory hurdles, it should help counteract CenturyLink's currently decaying business model. So while CenturyLink might not be a yield trap on the scale of either Frontier or Pearson, there is still a fair case to be made that investors would be better served by avoiding this high-yield stock.